Reading A-Z is a mega-site for all things reading, one of 7 amazing sister sites under Learning A-Z’s umbrella. 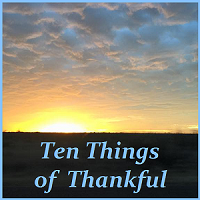 (In a previous post, I described the abundance of useful features in Writing A-Z.) Reading A-Z just keeps getting better and better. It was launched in 2002 as a resource site for teachers with printable leveled books and a small selection of decodable books. Its expansion since then has been phenomenal. Reading A-Z continues to provide books, now more than 2500 (including English, Spanish and French versions) at 27 reading levels. But this site goes far beyond downloadable books. From the new project-based selections to tools for assessments, this site has a wealth of materials for individual and classroom use. 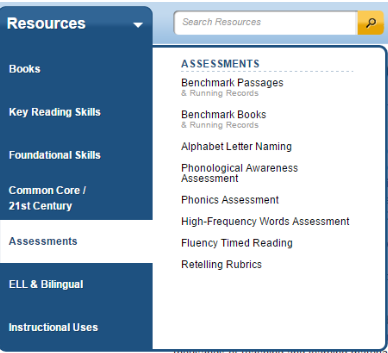 Considering the breadth of resources provided, Reading A-Z is extremely well organized. I decided to use screen shots instead of words to illustrate what your membership provides. 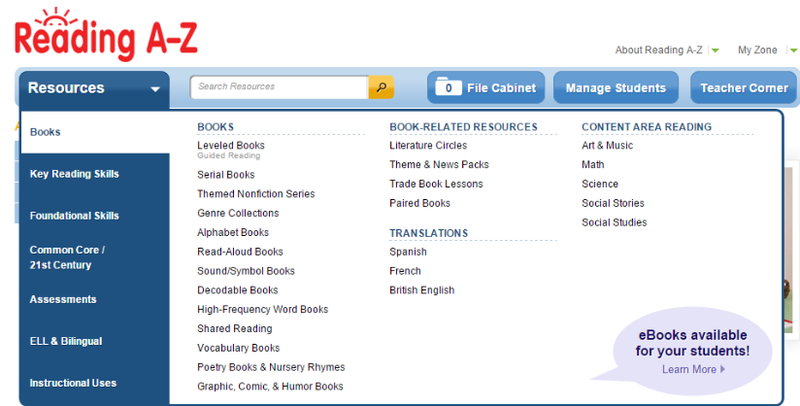 Under the Resources tab, teachers can access the following types of books by category (their decodable selection remains small), related resources (such as trade book lessons and literature circles), and materials by content area. 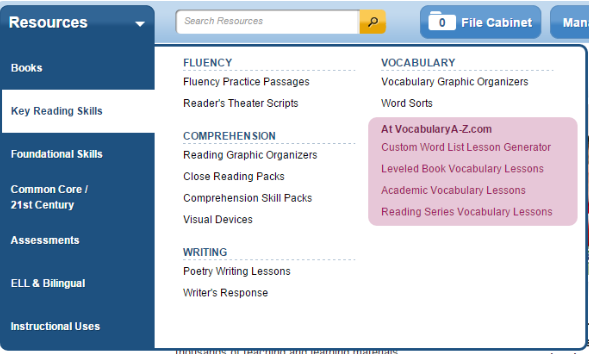 The Key Reading Skills area features materials related to fluency, comprehension, writing, and vocabulary. To support comprehension of visual materials, there are recipes, schedules, pie charts, maps, flow charts, and much more. Their Close Reading Packets are terrific. I have subscribed to Vocabulary A-Z (in pink below) and it’s equally well done. Under Foundational Skills, you’ll find excellent guidance on teaching phonics and phonological awareness to regular ed students, a portion of whom will struggle significantly if not provided these components of reading instruction. 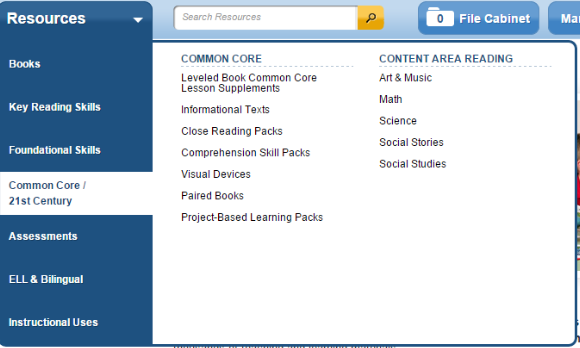 Common Core/21st Century resources include supplemental materials for the “regular” reading lessons with an emphasis upon academic vocabulary, graphic organizers, and close reading features, among others. Under Assessments, Reading A-Z’s timed fluency passages and retell rubrics for fiction and nonfiction are especially worth using. The benchmark passages are aligned with the Fountas and Pinnell leveled reading system. For ELL and Bilingual students, many books are already available with a regular subscription, but to access their full range of materials, you must purchase an additional license. 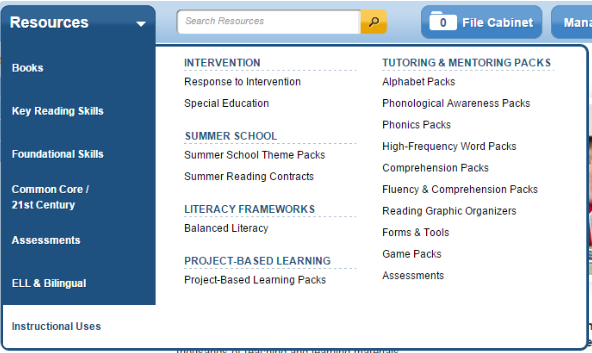 Instructional Uses organizes resources into sections for specific use, such as summer reading or project-based packs. This section includes thirty graphic organizers and a wide selection of matching and other games. They also provide useful forms, tips, and labels for teachers. Books are usually available as single sided, double sides, and projectable; they may be printed in black and white or color in most cases. Each book is accompanied by a lesson plan, discussion cards, worksheets, and comprehension quiz. Teachers may “file” any materials in an online filing cabinet with easy access to individualized folders. The cost of a yearly subscription to Reading A-Z is very reasonable. Learning A-Z also offers membership discounts, typically before the school year starts. If you’re not sure whether this site is for you, there are free 14 days trial for all Learning A-Z sites. I highly recommend Reading A-Z! Posted on February 28, 2015 by teachezwell	• This entry was posted in Technology Cools and tagged graphic organizers, online site for reading instruction, Reading A-Z, reading materials and lessons. Bookmark the permalink. is well-known for its vast library of printable and projectable readers at 27 levels of difficulty. But the leveled readers are just the beginning! There are also books in many genres and formats, fluency passages for timed reading, customizable worksheets, poetry, reader’s theater scripts, Spanish resources, and dozens of other classroom resources and tools. You visited the site! Thanks for sharing, Miran.